The present work aims to study the cultural concepts of the health in general and mental health in particular from six villages of Sundarban region, West Bengal, India, by using field research methodology, viz, participants observation, focus group discussion and in depth interview. A qualitative data was collected from the field. Analysis of the data shows that there is a clear difference of conception among the people of the region according to their socio-economic status. 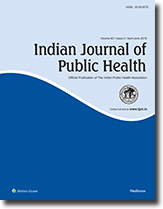 Poor and non-educated segment stressed much more on the physical ability and lack of economic resources in relation to health, whereas educated and comparatively economically stable segment with some urban influence, stressed more on both physical and emotional stability as a measure of good health. The pattern of help seeking also reflects different preferences towards traditional and modern treatment facilities available in the region. Results on the study promoted to take intensive community awareness programme for effective health coverage of the population. Disaster management is essentially a multi-sectoral and multidisciplinary endeavor. The status of disaster preparedness, coordination among different sectors and its impact on disaster management performance were studied and compared in two flood prone comparable districts viz. Midnapore and Murshidabad of West Bengal. The perception of state level officers about important job responsibilities of other departments in relation to disaster management and its intersectoral co-ordination was found mostly satisfactory; but this desired status did not prevail at district level. Lack of co-ordination among some sectors at district levels persisted in Murshidabad district, indicating comparatively better intersectoral co-ordination in Midnapore district. Thus, 'early response following flood' the most important indicator of adequacy of pre-disaster preparedness was found significantly better in Midnapore district. On the contrary, due to liberal use of Radio transmission set for flood warning, a significantly higher proportion of affected families in Murshidabad district received early flood warning compared to Midnapore. Organisational aspects of disaster management need to be improvised with role clarity of different departments in relation to other sectors involved in this endeavor.